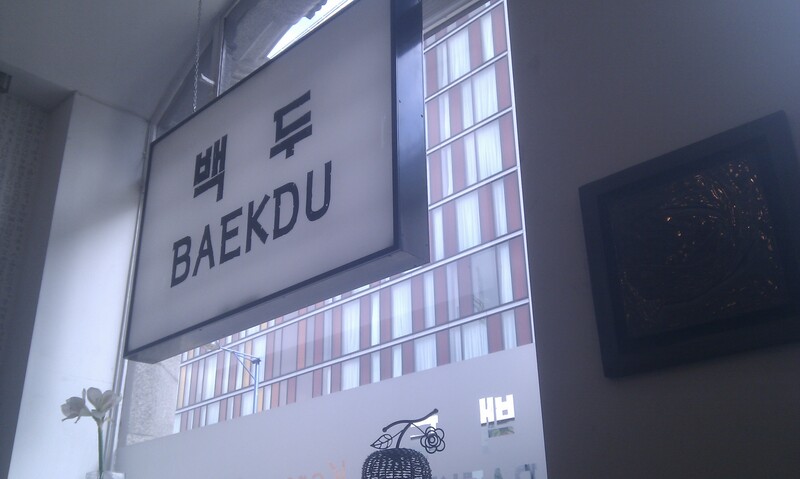 First up is Baekdu. Perched on the edge of the Northern Quarter just near Shudehill bus station is an unassuming Korean restaurant. Head through the doorway and it gets even more unassuming; very little decor, plain black furniture and big windows on one side. Having said that, if you’re coming to a restaurant for the decor, you’ve missed the point. So if you’re not here for the look you’ll need to know what the foods like. The news is it’s good stuff. The potato pancake is awesome on many levels. ‘How many levels?’ Good question. I’d say three. Firstly, it’s visually appealing. The orange hue from this pancake is great to look and the colour comes from the addition of carrots but also indicative of the great flavour. The outside is crispy but with a starchy centre which makes this almost comfort food-esque in texture and taste. The third and final part which brings it up from comfort food to moreish dish is the addition of soy. When dipped, this becomes quite an addictive salty dish, despite how filling it can be. The bibimbap is also worth noting. Anything that turns up sizzling in a dish and covered in chilli sauce clearly has my attention. 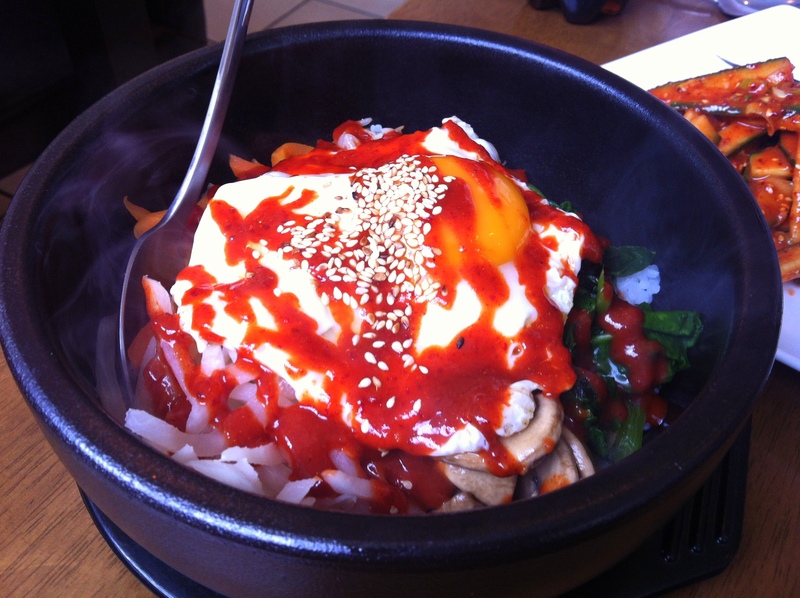 Warm rice, vegetables, mushrooms, chili sauce and egg all combined to give a fresh tasting but filling dish. I’d say we struggled to find anything on the menu that wasn’t vibrante, well seasoned and full of flavour. And remember, don’t judge a book by it’s cover. This is the Sundae. By the way, that’s the Double Deep New York Cheesecake in the background. Also awesome. It is every bit as deliciously decadent as it looks. Chewy, chunky fondant brownies with crushed pistachio over pistachio ice cream. Every bit was sweet, slippery goodness and perfectly balanced with the sugar content too. Incase you were worried that you may have to get to the end of this dessert and look down at your plate with longing then fear not. This thing is massive. For the first time in my life I had to give up on it. Dessert 1 Me 0. Sometimes a restaurant has one dish that is worth going back for, almost regardless of the rest of the menu. This is one of those dishes. Unusual looking bibimbap, looks tasty though 🙂 try seoul kimchi if you’re ever near upper brook street because it’s the best Korean in manc I’ve been too outside of Seoul, the ginseng soup, japchae and kimchi soup is the business! Still not been over to Seoul Kimchi. I’m moving up my priority list based on that recommendation. You are SO wrong about Felicini! I live in Italy for 3 or 4 months each year and Felicini’s food bears no resemblance to the tasty fresh and simple dishes we eat every day in Italy. Felicini relies on mass produced inferior ingredients to create bland yet over elaborate dishes which may mimic the Italian original but which are way short of the mark. What is available at their outlets is “Britalian” food aimed at an uninformed and easily satisfied market. I’d concede that this wouldn’t pass for Italian food in Italy, but it’s all relative. For a chain, they are producing food of a reasonable standard with one or two decent dishes. The standard has to be judged on the market it aims for and I don’t think Felicini’s typically audience is largely familiar with Italian cooking other than what is widely available in the UK. Having said that, I’d still consider it a reasonable attempt for a chain restaurant. In turn I’d concede that Felicini serves a particular market which is,perhaps, not familiar with genuine Italian cuisine? But isn ‘t it a cop out to aim at the lowest common denominator? Wouldn’t we all enjoy it more if Felicini moved upward towards a more discriminating customer? The food would certainly be better and it need’nt cost any more. I don’t think it is that simple. Having had some experience in the restaurant trade and speaking to chefs and owners, margins are tight and the problem with chains is that they are very profitable. Many good restaurants have gone under while many mediocre establishments go from strength to strength. I think you need to combine great ingredients, a knowledgable chef and a business person with great aptitude for creating demand. That’s a combination which is hard to come by.